There are three kinds of people. Those who call people names; those who get called names by other people; and those who call themselves names. Some versatile individuals manage to straddle all three categories. Not long ago, the PM was called the non-biblical version of a biblical ‘fornicator’ by an MP in Parliament. Then, more recently, the MP was among those who walked out of the House when the PM called him and some of his consorts, er cohorts, the un-parliamentary version of ‘procurers of sexual favours’. Now, I’m not sure what names the PM and/or the MP is/are calling each other in their un-Parliamentary thoughts right now. Or, more likely, with what encomiums in their own minds they are congratulating themselves – and, perhaps, each other – on the smokescreens that Parliament provides now and again for Government. I am fairly certain, though, that certain shenanigans in our ‘august assembly’ are a fait accompli to cover a multitude of sins... and no more... That’s the most charitable view, really, which one can take of uncharacteristic losses of the customary savoir faire and traditional sang froid that we’ve come to associate with the PM and certain MPs. The MPs who walked out in a huff over the PM’s un-Parliamentary reference to some of them as “p*mps” and “gyps**s” (taken together, he might mean to say “vagrant-vagabonds”) walked out over a non-issue that was not debated. It was a non-issue, at least for Parliamentary purposes on that day, because the Speaker had not had time to study the statement to be made by the collective of MPs, which was submitted a few hours before the sessions of the House. It was not debated, at least according to the Speaker, for the same reason. 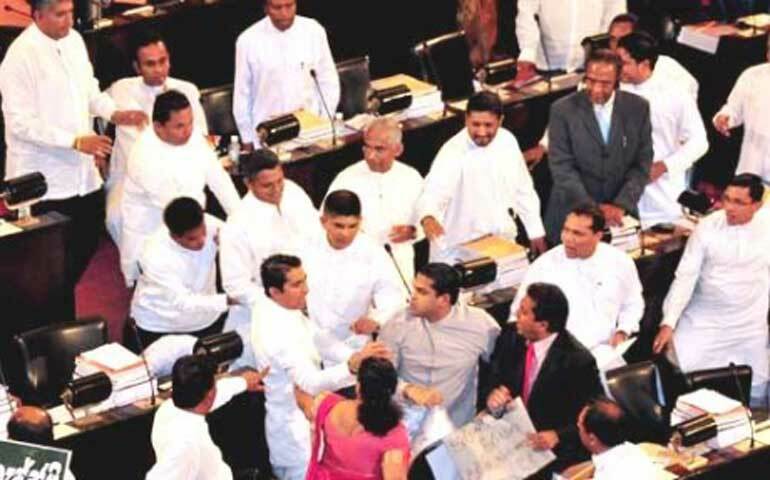 The MPs walked out because they thought the PM’s interjections and ejaculations against them was to provide a smokescreen so that the issue of the transfer of Central Bank employees who testified against the UNP’s embattled CB Governor would not be debated. The PM probably thought that the MPs walked out ostensibly in protest at his un-Parliamentary language as a smokescreen against their own lamentable approach to Parliamentary protocol in this and other issues. What a tangled web we weave, when first we practise to deceive! Government these days must be thankful for as many smokescreens as it can muster – by design (the PM) or by default (some opposition MPs). There is so much going on in the real world of governance – good, bad, and/or ugly – out there that anyone drawing red herrings across the news-and-comments trail is welcomed with open arms and shouts for >more of the same, please>! In the good old, bad old, days, it was bread and circuses (Deyata Kirula, diasporic conspiracies) that the Rajapakasa regime regaled the gullible masses with to distract their attention from a costly war; rampant and rapidly institutionalizing corruption; and the strategic, self-serving breakdown of law and order. Now, under the Sirisena~Wickremasinghe administration, it is mostly an amusing and often wildly entertaining three-ring circus (ex-Prez & Co.’s antics, exhuming bodies without just cause or salutary result, exulting prematurely in macroeconomic progress yet to be made, etc.) that draws the public eye away from Good Governance’s increasingly poor showing. Maybe the only positive qualitative change is the absence of egregious crimes against critics of the state/ruling class, dissenters against this Government and its mandarins, and minorities whom it is politically expedient to persecute. Perhaps all of us *wild asses* can and must be more grateful and say so more often in public. Remind me sometime to say thank you kindly, sirs, for this relief. I mean it. I truly do. There is, in the meantime, the question of what these smokescreens are concealing. Many will question the premise itself, pointing out that these entertaining happenings are simply chance or coincidence, and that to call them red herrings is to interpret Parliamentary action and Governmental intention through a #hermeneutic of suspicion. But there are so many stray strands of the short-lived Good Governance story going haywire that the #hermeneutic of grace and charity is coming apart at the seams. So we must regretfully ask the reader to enquire more assiduously after the smokescreens and red herrings. If only so that we can tell them apart from the real thing! First, there’s the macro picture, where we’re told that the World Bank (WB) and the International Monetary Fund (IMF) will extend unconditional support to revive Sri Lanka’s flagging or fainted economy. Well, forgive my cynicism/scepticism, WB- & IMF-wallahs, and with all due respect to Ravi Karunanayake (no, scratch that! ); such good news makes my blood run cold on behalf of our farmers, fishermen, factory-workers, and other microeconomic ‘beggars’. And none of us can be so naive as to imagine that the global financial powers that be – who would now lord it over our fiscal and fiduciary affairs – are doing it for love of nation, state, country, or economy. No need to get too enthusiastic, Mr. Finance Minister, about what we (read: you or yours!) have done to deserve this... We have heard it all before, sir. Where has it got us (read: we the voter) in the absence of aid? And, if killing murderers so that murder will not be committed because life is sacred isn’t ironic enough, there’s the unfathomable fate of Pillaiyan. Here, if at all, is proof or at least a semi-convincing demonstration that an ex-militant can be reformed enough to represent at least some people’s mandates in Parliament. But no, he must now pay for the alleged crimes he purportedly committed in the name of – wait, what was it, Good Governance? Democracy? No, expedient demise! No, democratic expediency! Oh, and saving the blessed republic from a reign of terror! So, who’s going to be the next? ‘Col.’ Karuna, the military messiah and a previous government’s political saviour? ‘Treasurer’ KP, the alchemist treasured by those in pursuit of the philosopher’s stone or a pot of gold at the end of the rainbow? Don’t hold your breath, folks! There’s more than one way to skin a cat and keep your reputation as an animal-rights lover still intact. Which reminds me just how much international events – and how they’re packaged and how they’re presented – can have an impact on domestic happenings. It didn’t take long after President Maithripala Sirisena’s return from the UNGA forum ‘triumph’ for the cat to be let out of the bag. Not only was our head of state portrayed as a hero in the eyes of a nation grateful for staving off internationalist intervention, the rewards that were commensurate with such heroism were quickly and clearly revealed. The humble leader who swore he wouldn’t occupy – much less extravagantly renovate – numerous presidential abodes now seemingly sees multiple residencies for himself as part of the present. Thankfully, Government’s budget doesn’t stretch as far as a gullible nation’s gratitude. MS has since seen sense. One way to see things is to say that the way things are is simply the order in which events happened. There is no need to get excited, much less engage with our excellent Government or the emergent global order. Things would have happened anyway, and there’s little we can or must do about it. Things as are they are – and behind them there is nothing. This is naive, but gives hope – even if a false one – that all is well; that everything happens for the best in the best of all possible worlds. Another less sanguine perspective is to introduce meaning into what happens or what has happened. There is some need for energy, because Government’s actions in response to the global powers’ initiatives suggest that cause and effect can be harnessed. Things might have happened this way anyway; but since there seems to be a causal link that’s neutral in and of itself, we might sigh... or sit up and take note... and enter into the stream of things with neither an underhand agenda nor undue agitation – much like all the other players on the stage. This is natural: a pragmatic point of view which readily accommodates as necessary the way things are. Things are as they are – and behind them there is some concrete purpose, if no perverse conspiracy. Then there’s the cynical or subversive view. It’s the most nauseating of them all, but helps us to take stock of reality better than the two mindsets above. And its proponents will contend that things are not as they are – behind them there is something nasty, or at least not so nice. In this view, Good Governance is now merely a crutch for an administration that is rapidly going lame; the incumbent Government is in the same rut as the previous regime was; the Opposition will critique the powers that be in Parliament for public consumption but collude with them in private when the bottom line is lucrative enough; the WB and the IMF are keener than ever to enrol Sri Lanka in the Brave New World Order; and China’s ambitious plans to lay a 21st Century Maritime Silk Road from the East to Europe threaten to dash our ‘big brother’ India’s aspirations to Indian Ocean hegemony. Now you can choose to be nice and naive, or natural and necessitarian. But if you’re anything like the normal Sri Lankan, you might opt for the cynical or sceptical point of view. This frame of mind doesn’t mean you’ve opted out of critical engagement. That frame of mind means precisely that you’ve co-opted yourself as a stakeholder in the emerging local order of governance and citizen participation in it. If every citizen of Sri Lanka were to adopt a healthier #hermeneutic of suspicion towards their elected representatives, it would not be a national disaster. It might save us – and them – some future grief, and no small measure of present embarrassment.